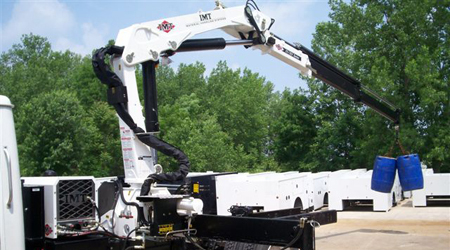 IMT offers a wide range of articulating cranes from roughly 2000 lb max capacity and 23' of reach all the way up to 35,000 lbs and 66'+ of reach. Beyond mounting the crane, we can help with customizing toolboxes, hydraulic tooling, attachments, air compressors or custom bodies. IMT keeps a fair amount of cranes in stock to keep your lead times down. Inventory mix changes all the time so please give us a call to find out what's on the ground.